This delightful puzzle cube depicts the story of Noah's Ark through simple, vibrant art with 6 creatively designed puzzles for little hands. 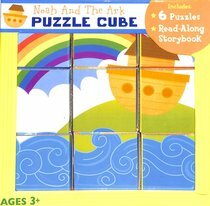 Each side of the puzzle cube shares an important sequence of the story, including: Noah building the ark, animals coming aboard the ark, a dove finding an olive branch, and God placing a rainbow in the sky. About "Noah's Ark Story Puzzle Cube"
The Twin Sisters (r), Kim Mitzo Thompson and Karen Mitzo Hilderbrand have been award-winning children's authors and record producers for over 28 years. The twins have written thousands of products for children including over 3,000 songs, 500 digital albums, 160 e-books, 500 teacher resources, 15 apps, and hundreds of books and children s products! Besides being authors, the fraternal twins run two companies Creative IP, LLC and Twin Sisters IP, LLC. Both are dedicated to creating and licensing exceptional products worldwide. Kim graduated from The University of Akron with a Master's Degree in "Integrating the Arts in the Elementary School Classroom". Her teaching degree has allowed her to create educational and inspirational products for children worldwide. Kim enjoys sports, especially basketball, writing books for children, cooking, and being a mom to her three children, Austin, Morgan and Bailey. The Twin Sisters (r), Kim Mitzo Thompson and Karen Mitzo Hilderbrand have been award-winning children's authors and record producers for over 28 years. The twins have written thousands of products for children including over 3,000 songs, 500 digital albums, 160 e-books, 500 teacher resources, 15 apps, and hundreds of books and children s products! Besides being authors, the fraternal twins run two companies Creative IP, LLC and Twin Sisters IP, LLC. Both are dedicated to creating and licensing exceptional products worldwide. Karen graduated from Purdue University with an Industrial Engineering degree and is an avid scuba diver who also enjoys singing, playing piano, and volunteering. She is also the proud mother of Tyler Hilderbrand who is a fitness model and personal trainer and nutritionist.